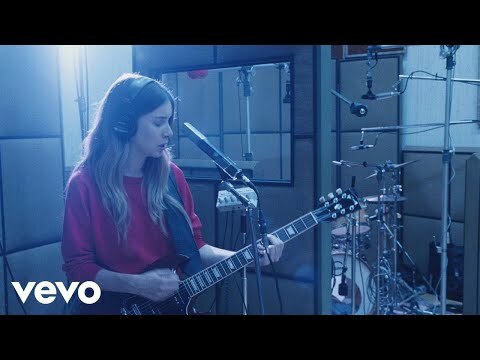 From the San Fernando Valley in Los Angeles, Haim is an indie pop/rock band made up of three sisters who grew up playing and singing classic rock songs with their parents in a family band called Rockinhaim. Ten years of performing at local street fairs and charity events with Rockinhaim has contributed to Haim's strong vocal harmonies and melodies. The band's shows initially begin with Este on bass, Danielle on lead guitar and Alana on rhythm guitar, but they seamlessly switch instruments throughout performances. Haim has written and recorded all of its own material with no help from outside sources, and this bit of talent was noticed by indie music sweetheart Jenny Lewis, who invited Haim to tour as her backing band. thank you @rodarte for inviting us into your wonderous, beautiful, magical world! ps lanzo is that you?